Many medical discoveries of the late 19th century contributed to the creation of the artificial pacemaker. By 1900, cardiac specialists knew that the heart was a muscle which contracted steadily in order to pump blood throughout the body, and were also aware of the effects that electricity produced in muscle tissues, namely contraction. Furthermore, the invention of the electrocardiogram (ECG) in 1902 gave the most accurate information about cardiac electrical output to date, and helped doctors further understand conditions such as Stokes-Adams syndrome, which renders the natural pacing of the heart unreliable. German-American physician Albert Hyman created the first artificial pacing machine in 1932. It was an external, handheld device, driven by a modified car starter, with a needle electrode for direct cardiac stimulation. Unfortunately, the device frequently suffered technical difficulties, and its application could not be sustained. Pacer technology developed steadily through the 1950s thanks to a number of doctors and research experiments: notably, the works of Drs. J. Hopps and W. Bigelow at the Banting Institute in Toronto, Dr. P. Zoll from Harvard in Boston, and Dr. W. Lillehei at the University of Minnesota. These contributions, combined with Dr. Lillehei’s ground-breaking heart surgery methods, helped create the first hospital in-patient pacing machines. The early machines were awkward and bulky, and plugged into the wall. Often wires passing into the chest heightened the risk of infection in long-term cases. The need for a safe, implantable, long-term pacer was obvious. 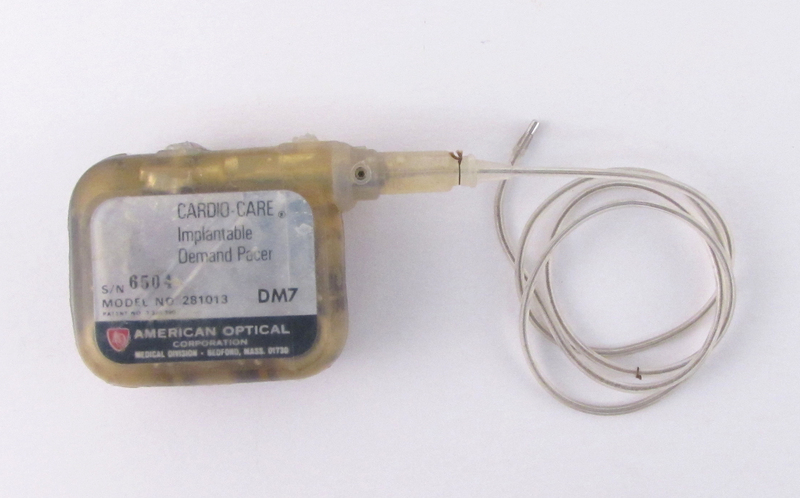 Throughout Europe and the United States in the late 1950s, experimentation with pacer technology resulted in smaller and lighter units for patient mobility; advances in battery technology by 1960 finally made an implantable pacemaker feasible. The first unit with any marked reliability was designed by a team from Buffalo, including engineer W. Greatbatch and Drs. W. Chardack and A. Gage of the VeteransHospital. In 1960, after three years of work, a 6cm zinc mercury oxide battery and transistor, cased in epoxy resin with new leads and electrodes, was built. The shocks from these electrodes stimulated the heart comfortably and kept it pumping at a steady rate. The pacemaker was successfully implanted in a 77 year-old man, who survived over two years with the implant. Today, implantable pacemakers have become the norm, with external pacing reserved solely for emergency and temporary situations. The pacer pictured here, manufactured circa 1965 by the American Optical Corp in Massachusetts, is from the years following this breakthrough. This large unit, over 10cm long and weighing 170 grams, is an early ‘demand pacer’ model designed to help cases of arrhythmia. Demand pacing uses a sense amplifier to control the output circuit. When the electrical activity of the heart is within a safe output range, monitored by the sensor, the pacer will pause as the heart beats naturally. Dibner, Bern. Luigi Galvani. Encyclopedia Britannica Online Academic Edition. Encyclopedia Britannica Inc, 2013. http://www.britannica.com.proxy.queensu.ca/EBchecked/topic/224653/Luigi-Galvani, 20 July, 2013. Siddons, Harold, and Edgar Sowton. Cardiac Pacemakers. Charles C Thomas, publisher. Bannerstone House, Springfield, Illinois. 1968. 4, 65-66.